Faculty experts from the Steven J. 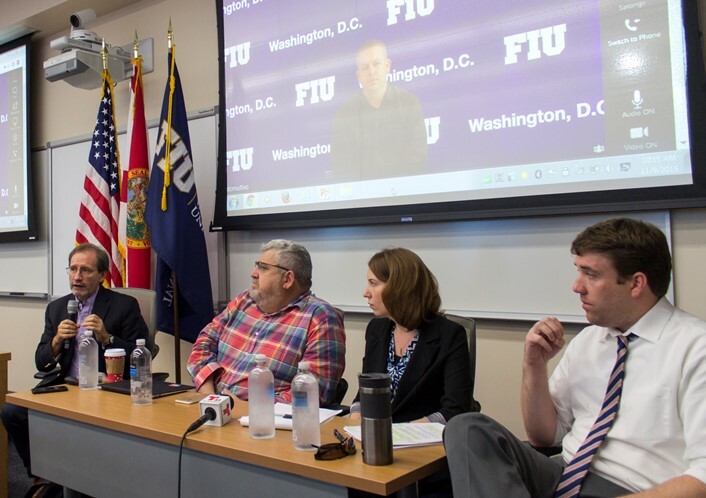 Green School of International and Public Affairs (l to r: Eduardo Gamarra, Dario Moreno, Sara Moats and Kevin Evans) discuss the results of the 2016 presidential election. Republican Donald Trump’s surprising victory in the 2016 presidential election this week left pollsters and pundits around the globe speculating about what such a drastic change in American political leadership could mean for the United States – and the world. To help sort through the implications this election may have on everything from immigration and foreign policy to race relations and the economy, faculty from the Steven J. Green School of International and Public Affairs joined an expert in diplomacy from Washington, D.C. for a post-election analysis that drew more than 100 students and many members of the media. What did they have to say? View the entire event online at the Green School’s Facebook page. Here are some key takeaways from professors in the Green School’s Department of Politics and International Relations, as well as historian and diplomacy expert Vince Houghton, who joined the discussion from FIU in D.C. Voters were frustrated and wanted change, according to Dario Moreno, a nationally recognized expert on Florida politics, Miami politics and Cuban-American politics. Trump was the candidate who most sensed that frustration and capitalized on the pain of working class voters. In this election, people chose change over stability and certainty. Trump better mobilized his coalition, said Kevin Evans, an expert on the U.S. presidency and Congress. While Trump’s supporters were demographically similar to those who voted for Mitt Romney in 2012, they came out in larger numbers than expected in key swing states this election. The majority of Trump voters were white and more than half were men. White evangelical voters played a role too, coming out in stronger numbers for Trump than they did for Romney. Millennial voters did not turn out as expected, said Eduardo Gamarra, founder of the Latino Public Opinion Forum, an initiative that studies the impact of Latino voters on U.S. politics. Perhaps out of disappointment that Bernie Sanders was not the Democratic nominee, many younger voters simply stayed home. In addition, the “sleeping giant” of Hispanic voters showed stronger support for Trump than many observers expected. The Democratic Party was complacent, said Vince Houghton, historian and curator at the International Spy Museum in Washington, D.C. Party leaders “dropped the ball” by failing to visit key states in middle America that they assumed would vote for Hillary Clinton. Conversely, they counted on voters in major cities to “come out in droves” and it “doomed them,’’ he said. 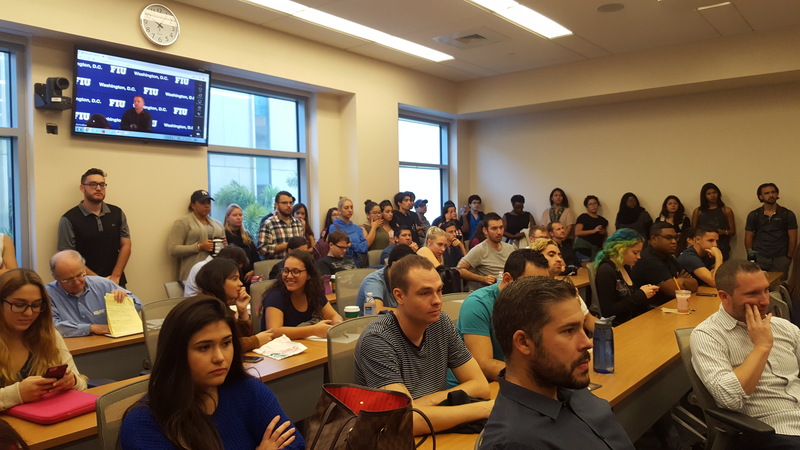 Both candidates were seen as unlikeable, said Sara Moats, who co-teaches a class on the election with Moreno. However, those who viewed Trump unfavorably were more willing to vote for him than those who disliked Clinton, she said. His rallying cry to “make America great again” resonated with middle American voters who are worried about the future. In many ways, it is a “new America,” the panelists agreed. Trump’s nominations to the Supreme Court could have consequences for decades. His first action may be to appeal Obamacare, impacting millions of Americans. His attitude toward NATO and perceived alliance with Russia is cause for concern. However, the panelists also urged voters who are dissatisfied with the outcome to get involved in the political process now to try to make a difference in the issues that matter most to them. Students listen as Green School faculty experts discuss the implications of the 2016 election. After a long time, finally we’ll have more jobs, lower taxes, freedom of expression and less terrorism in the world. Pollsters got it completely wrong. It’s incredible how much money they spent for nothing.